A must have for any robusto cigar fan. Our 12 Cigar Robusto Sampler includes 12 cigars from top premium cigar brands. A must have for any robusto cigar fan. 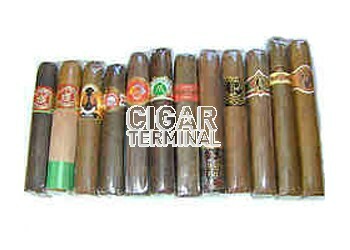 Our 12 Cigar Robusto Sampler includes 12 cigars from top premium cigar brands. We put together the robusto sampler from the very best lines available when you place your order. Cigars come from lines such as H. Upmann, Arturo Fuente, AVO XO, CAO, Casa Magna, Don Tomas, Montecristo, Montesino, Cusano 18, Perdomo, Rocky Patel Vintage, Ashton, Punch, Oliva, Padron, Fonseca, Romeo y Julieta and other top premium cigar brands.